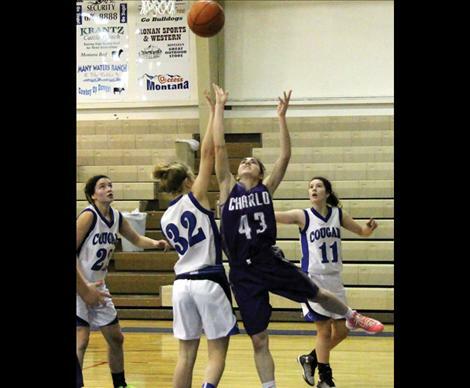 CHARLO – The Lady Vikings mean business when their feet hit the court and business was good as the Lady Vikings toppled two opponents, kicking off their season with a perfect 4-0. On Friday the Lady Vikings dominated their home court, crushing Mission 54-24 while staying more than one step ahead of the Lady Bulldogs from the moment the ball went into play. Mikaylan Roylance and Shayna Nagy led the blowout with Roylance logging a game high 15 points and Nagy right behind with 14. Skyler Frame added 10. At St. Regis on Saturday, the Lady Vikings pulled the rug from under their 10C rivals, scoring 15 in the fourth frame to claim the 47-40 victory after a close running contest. Sisters Shayna and Cheyenne Nagy combined to dominate scoring with Shayna netting 17 and Cheyenne chipping in 11. The Lady Vikings will travel to Noxon Jan. 3 and then will return to host Columbia Falls Jan. 6. Mikaylan Roylance 15, Shayna Nagy 14, Skyler Frame 10, Cheyenne Nagy 8, Sienna Brown 3, Lindsey Tryon 2, Kenzie Couture 1, Ashley Tryon 1. Shayna Nagy, 17, Cheyenne Nagy 11, Skyler Frame 8, Mikaylan Roylance 7, Sienna Brown 2, Lindsey Tryon 2.